Joan started piano lessons before she was in school, and learned to read music and words at the same time. She had a number of different piano teachers growing up because of frequent moving, and that experience made her realize that there is not any one “right” teaching method. Therefore, Joan tailors music lessons to the individual student working with each person’s strengths and preferences. Joan continued her piano lessons throughout high school and then studied music with university professors while in college and graduate school. 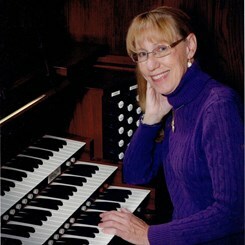 Joan has also been a professional organist for over 18 years. Joan has been teaching piano since 1973 and accepts students of all ages, from beginning to advanced levels. Joan started singing seriously in high school where she had an excellent music program. She has sung in various school choirs, church choirs, and community choirs since then and has also done some solo work. Joan studied with university professors while in college and graduate school. Joan has directed several children’s choirs and a community choir. Joan has been teaching private voice lessons since around 1998 and will accept beginning and intermediate level students. Learning to read music does take some effort, and yes, you need to practice. The final result is worth it because you’re making music and having fun doing it! Request Lessons with Joan Fradenburgh today!